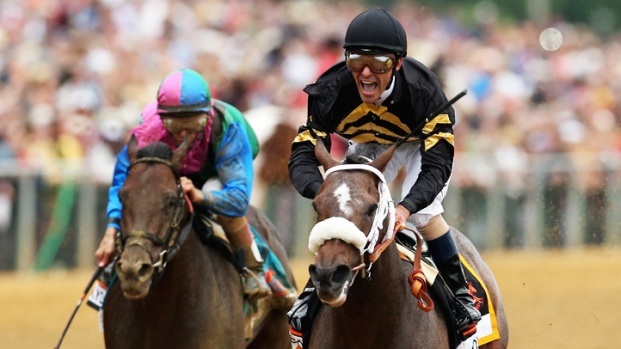 Oxbow, ridden by jockey Gary Stevens, wins the 138th Preakness Stakes horse race at Pimlico Race Course, Saturday, May 18, 2013, in Baltimore. History will have to wait at least one more year. Orb, the Kentucky Derby champion who many hoped would become the first Triple Crown winner in 35 years, finished fourth in the Preakness Stakes on Saturday, as 15-1 longshot Oxbow pulled off a surprise wire-to-wire win at Pimlico. "It's so special," said Oxbow jockey Gary Stevens, who came out of retirement this year at age 50. "We were kind of flying under the radar after the Derby. Didn't get a lot of respect." Oxbow trainer D. Wayne Lukas seemed to take pleasure from dashing Orb's Triple Crown hopes. "I get paid to spoil dreams," Lukas said. Orb's fate may have been sealed days before the race, when he drew the No. 1 post position along the rail -- only two horses have won the Preakness from that position over the last 63 years. Sure enough, Orb got boxed in against the rail by a pack of horses early in the race, and could never find room to break free. Meanwhile, Oxbow pulled ahead of the pack and never relinquished the lead. "When I hit the half-mile pole, I just said, 'Are you kidding me, is this happening?'" said Stevens, who worked for NBC as a racing analyst during his seven-year retirement. Oxbow finished the 1 3/16th-mile race in 1:57.54. Itsmyluckyday finished second, Mylute finished third and Orb, the 3-5 favorite, finished fourth. But nobody ever gave Oxbow a serious threat. 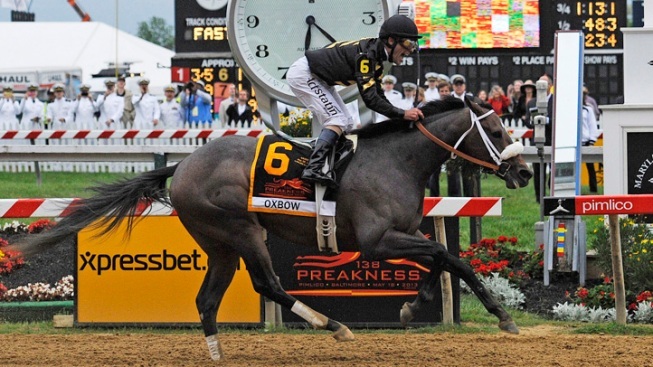 It's a landmark win for Lukas: Oxbow's Preakness victory marks the trainer's 14th Triple Crown win, the most ever. 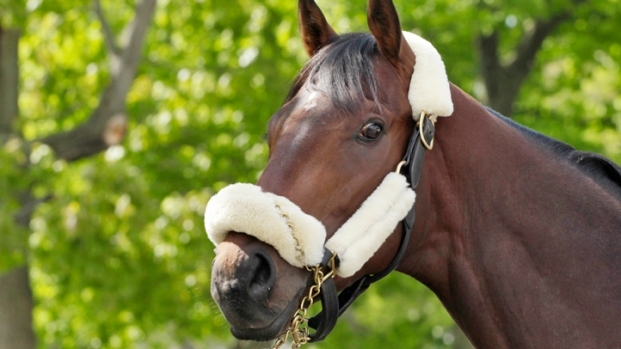 He's won the Preakness six times, and the Kentucky Derby and the Belmont four times each. He passed James Fitzsimmons, who has won 13 Triple Crown races. Jockey Gary Stevens has now notched three wins apiece at the Kentucky Derby, Preakness, and Belmont over his career. Oxbow's win means the Triple Crown drought continues. In the lead-up to the Preakness, Orb seemed like a prime candidate to end that drought, and bettors made him a heavy favorite. His breathtaking late push in the Kentucky Derby had people believing: He emerged from the back of the pack down the stretch, blew past a large group of horses and pulled away from the pack for a dominant win. Combined with a pedigree to make race fans drool -- his blood lines includes two Triple Crown winners, Seattle Slew (1977) and Secretariat (1973) -- many thought the three-year-old colt would take a place among the horse-racing elite. Instead, he'll become another in a long line of almosts and what-ifs. Only 11 horses have won the Triple Crown, and none since Affirmed in 1978. Orb wasn't the only one trying to make history on Saturday who came up short in Baltimore. Rosie Napravnik, the jockey riding Mylute, hoped to become the first female jockey to win the race. Instead Mylute finished in third place. Kevin Krigger, the jockey riding Goldencents, hoped to become the first African-American jockey to win the race since 1898. He too came up short as Goldencents finished in fifth place.